KUWAIT CITY, July 11: Maritime Heritage Committee at Kuwait Sea Sports Club continues its preparations for the 30th annual Pearl Diving Expedition to be organized under the patronage of His Highness the Amir Sheikh Sabah Al-Ahmad Al-Jaber Al- Sabah from July 19-26, 2018, reports Al-Seyassah daily. The dhows for the festival are donated by HH the Amir Sheikh Sabah Al-Ahmad Al-Jaber Al- Sabah and late Amir Sheikh Jaber Al-Ahmed Al-Sabah. In a statement, head of the committee Ali Al-Qabandi revealed the activities of Habab and Shouna kicked off Wednesday. Habab and Shouna is a process of cleaning and preparing dhows for diving, which happened at the club’s headquarters in Salmiya, under the supervision of Captain Hamed Al-Sayyar who’s also known as Abu Bader. The Shouna ritual is an importance phase of pearl diving preparations where dhows are made ready for eventual sail into the waters of Khairan. The process of cleaning the dhows is called Habab. On the cleaned body of the boats, cotton is used to cover spaces between the overlapping wood pieces used in building them, and once that’s done, Shouna is applied using plates or bare-hands for waterproofing from the rudder to the waterline before allowing it to dry. The dhows are then pushed back into the water and made ready for the roping work of hoisting the mast and sails. Another supervisor and consultant of maritime arts and committee member Thamer Al-Sayyar said the activities of Shouna include the art of Sanji— popular traditional songs sung amid clapping and beating of drums at the end of preparation of dhows for sail. He explained that Kuwaiti songs have many categories; each meant for a specific occasion, but on the whole, there are work songs and celebratory songs. He noted the participating youth are undergoing a training course at present in camp to learn the practical and theoretical sides of diving, in addition to physical training to help them adapt to difficulties during their journey. 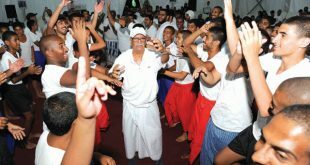 Sharbuka, an important part of sea songs is performed before the audience as musical instruments with only Dhafs and double-sided drums without any string instrument, while sailors exhibit a natural proficiency for rhythmic clapping to suit the songs, he explained. Al-Qabandi said the committee earlier in March organized training courses on the different positions of divers aboard. He extended appreciation to the platinum sponsorship provided over the years by Gulf Bank in addition to Kuwait Petroleum Corporation (KPC) with the support of Kuwait Flour Mills Company. The Kuwaiti Sea Sports Club has organized the first traditional pearl diving trip in 1986, starting with five vessels provided by the Ministry of Information. 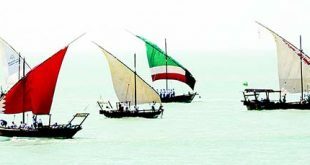 In 1987, the late Amir Sheikh Jaber Al-Ahmad Al-Sabah, who strongly supported the event and encouraged more Kuwaiti youths to participate in it, donated seven new vessels to the club that were made in Kuwait for the second annual journey. In 1990, all of the Club’s sea activities, including the pearl diving trips, were halted due to the Iraqi invasion of Kuwait in August, during which the Iraqi soldier destroyed a number of wooden vessels. In 1991, the Club resumed its activities after the liberation of the country and organized the fifth pearl diving trip on board of a ship donated by one of Kuwait’s old prominent sailors, Captain Rajab Ali. In 1994, the late Amir Sheikh Jaber Al-Ahmad Al-Sabah donated six new vessels to the Club and continued to support the pearl diving trips and events in the following years.